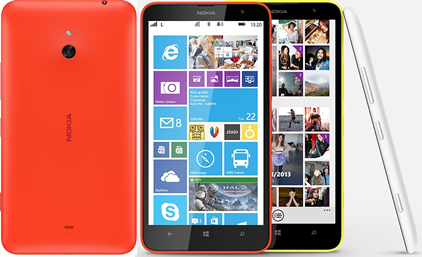 NOKIA LUMIA 1320-Big and beautiful Business smartphone in mid-range, affordable Windows Phones.It has latest Windows Phone 8 Update 3, Nokia’s firmware ‘Lumia Black’ and three rows of tiles. Nokia Lumia 1320 LTE-capable certainly doesn't have the features-kapow(Software) of the higher-end Lumia 1520, the Lumia 1320 is a good choice for someone who needs a large-screen Windows smartphone. Nokia Lumia 1320 have 6-inch 720 x 1280 display with a dual core Snapdragon CPU, 1 GB of RAM, microSD expansion, 3400 mAh battery and a 5 Mega-Pixel rare camera. ADD MAGIC TO YOUR PHOTOS. TAKE YOUR STUFF WHEREVER YOU GO.